My mantel clock is ticking, ten minutes too slow. 1:41 (1:51) AM. I can’t count how many times I’ve been late because of that clock. A simple fix: pop the back, take out battery, insert new AAA. Dang, no AAA’s. Does anything else in our house run on AAA’s? Must run to Target. Never remember, even when am at Target. That’s why the clock is running ten minutes too slow, five months later. It’s a gift from my mother. She bought it after a holiday décor-seeking mother-daughter shopping trip to our local Pier1. I saw it and fell in love, because it matched the side table with the wrought iron birds in the base that I’d giddily bought months earlier to help me feel nested in our brand new (to us) townhome. The clock cost $15, and I couldn’t afford it. It was a want, not a need, and I was being good. That Christmas season – one in which we’d promised to exchange no gifts and donate to charity instead – my mother presented me with the clock she’d seen me sighing over months earlier. Not a Christmas gift, she insisted, an ‘I love you’ gift. It cost $15, but to me it may as well have been $10,000, because she’d remembered. 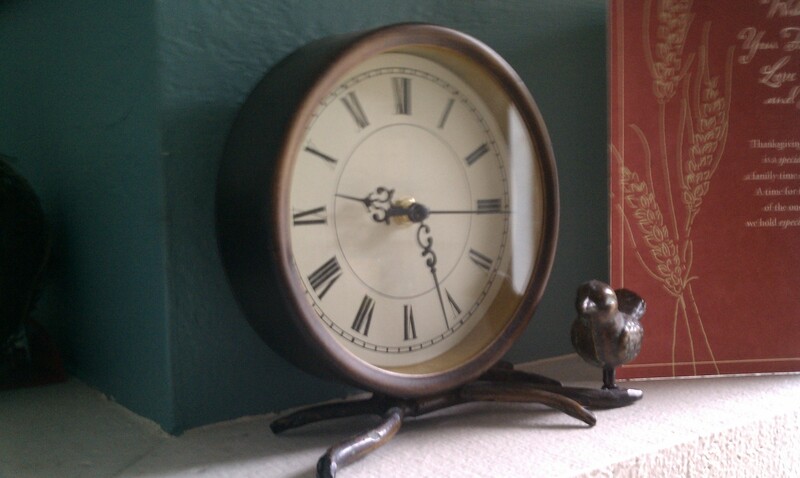 I grew up in a house that ran on ticking clocks. Clocks that would chime the hour, the half hour, the quarter hour. My grandma kept each one wound, and they kept the rhythm of the nights I couldn’t sleep. Nights where the shadows moved mysteriously across my bedroom (living room) wall. Nights I couldn’t figure out why I felt different than the other kids in my (borrowed) neighborhood. The nights my daddy wasn’t there, because we weren’t living with him just then. I timed my breathing carefully to match that clock’s tock-tick-tock, and Sleep – my constant, elusive playmate – would eventually find me. In the morning things were bright. The tick-tock-tick kept pace with my running feet and smiling breath. I was safe because I had my mom to hug me and tell me she loved me, my grandma to give me ‘Nilla wafers and milk and call me pumpkin, and my five aunts plus mom plus grandma to read me fairy tales, taking me to new places that I could visit in books and in dreams. In that house little girls were always special and someone was always there to listen to my thoughts and songs, and tell me I could be whatever I dreamed I could be. The light on our computer/TV keeps a blinking time with the ten minutes too slow tick-tock clock. Odd what you notice at 1:57 (2:07) AM. When sleep is as elusive as it was when you were little and your grandmother’s cuckoo clock marked the hours of your life.